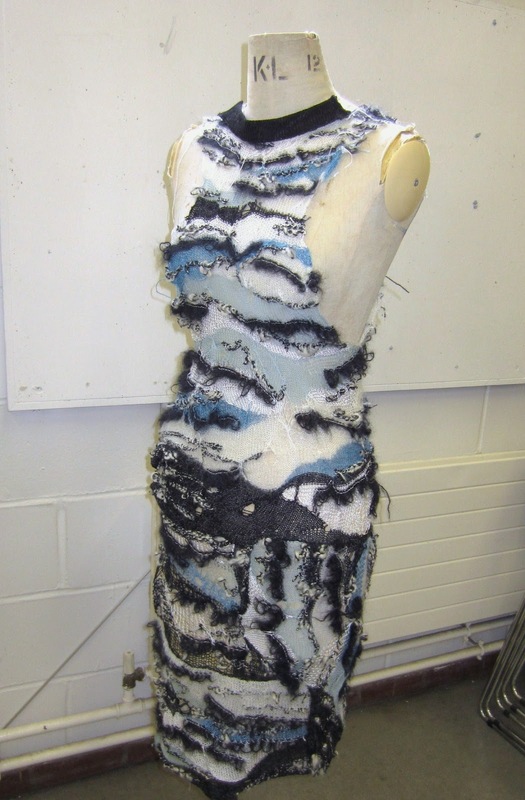 The following image shows the initial stage of one of my garments for my 'Neglect' project. The dress is made up of over 8 pieces of fabric, in which they have been produced on both a standard and chunky gauge domestic knitting machine. I have used a variety of techniques with which each of the smaller pieces making up the garment are all entirely different. The dress consists of pieces that have been knitted in different directions along with different sizes to create a sense of distortion and unexpectedness. I aim to extend the dress to almost floor length and finalise the solid black hem around the neckline to add a sense of order and intention to the finish of the garment.